God has arranged all things by measure and number and weight. Every man, in respect of his mind, is intimately related to the divine Logos, being an imprint or fragment or effulgence of that blessed nature. The belief that number is the language of reality is the bedrock of Western Civilization. Time and Space, the Many and the One, the Great Chain of Being, As Above So Below -- the idea that the pattern of Creation is determined by number is embedded in Western conceptions of God. Biblical numbers were symbols for its authors and early audience, expressing correspondences between nature, human experience, and the pattern of creation. That Biblical numbers have been interpreted different ways in different contexts for centuries is evidence of the flexibility of number as symbols. Determining what these numbers meant to their authors and original audience remains an interesting problem, especially in light of recent research regarding the astronomical significance of megalithic structures. The Gospel of St. John ends with a number -- the disciples cast their net according to the instructions of the Risen Christ and catch one hundred and fifty-three fish. The number one hundred and fifty-three is written elsewhere, in rock, at Stonehenge and the Great Pyramid of Cheops. One hundred and fifty-three is a scientific number; its square root is the exact number of lunations in a year. Did the author of the Gospel of St. John use this number because of its scientific significance? The Gospel of St. John begins, “In the beginning was the logos.” Logos is a philosophic term used by Philo of Alexandria (30 B.C. – 50 A.D) to reconcile Hebrew scripture and Greek philosophy. Logos meant pattern and implied mathematical relationship. When the Gospel of St. John was translated from Greek, logos became “word.” The author of St. John’s Gospel identifies Jesus as the “logos made flesh” and ends his gospel with a story that does not appear in the Matthew, Mark, or Luke -- the disciples, recognizing the Risen Christ for the third time, catch one hundred and fifty-three large fish, “and though there were so many, the net was not torn.” Placed in the powerful setting of a teaching of Jesus after his resurrection, certainly this number was intended symbolically. I have previously written on the symbolic interpretations of one hundred and fifty-three by early Christians. Evagrius Ponticus (345-399) interpreted it several ways, one of which was as an Enneagram-like symbolism of the ordered laws of creation suffused with grace. St. Augustine (354-430) also interpreted 153 several ways including as a trinity. St. Jerome (died 420), taking a turn toward modernity, interpreted 153 as the exact number of species of fish in the sea and therefore symbolic of the universality of the church. Whether interpreted neoplatonically (Evagrius and Augustine), or as an analogy (Jerome), the number one hundred and fifty-three appearing in an act of the Risen Christ was highly symbolic to the early audience of St. John’s gospel. What follows is an explanation of Mr. Heath’s discovery of the astronomical significance of one hundred and fifty-three within the context of the Gospel of St. John where it can be interpreted as part of a proof of the identity of Jesus as logos. Throughout, I will refer to the author of St. John’s Gospel as “the author” and not as “St. John.” The Fourth Gospel was written about 100 A.D., too late for the author to have been John, the disciple of Jesus. The Gospel of St. John can be read as a proof. The gospel begins with the idea of logos and ends with a story about catching fish in a net. In between, the numbers two, five, twelve, and one hundred and fifty-three are used in a step-by-step proof that Jesus is the logos. The story of Jesus feeding the multitude is a microcosm/macrocosm analogy. On earth as it is in heaven. As the Father, so the Son. As above, so below. Two, five, and twelve describe universal observed phenomena and the symbolism inherent in these numbers is simple. No education is needed to find meaning in these numbers. In using the numbers of the heavens, a universal phenomenon, the meaning is also universal. In St. John’s Gospel, the similarity between the miracles of the Father and Son – as symbolized by the numbers two, five, and twelve – become part of the author’s proof of Jesus’ identity as logos, mediator between God and man, a proof that can be understood independent of educational, religious, or philosophic background. The story of feeding the 5,000 was addressed to a Greco-Roman audience steeped in astrology. Within a culture that projected religion and mythology onto the planets, a miracle worked with the numbers of the sky would symbolize power over, or harmonic resonance with, the forces of the cosmos. In the fourth century when Christianity became the state religion of Rome, the Church began purging itself of paganism and the gospels, which were written for a pagan audience, were reinterpreted. Former meanings, including the astrological and neoplatonic symbolisms, were lost. During Jesus’ life, the disciples are uncertain about his identity. After Jesus’ death, they have difficulty recognizing him resurrected. The Gospel of St. John ends with a story similar to the miracle of feeding the multitude. In this story, the Risen Jesus instructs the disciples how to work a miracle for themselves. As in the story of feeding the multitude, symbolic number establishes correspondence between Father and Son. (v. 5) Then Jesus said to them, “Young men, have you any fish?” They answered him, “No.” (v. 6) He said to them, “Cast the net to the right of the boat and you will find them.” They cast therefore, and now they were unable to draw it up for the great number of fishes. (v. 10) Jesus said to them, “Bring here some of the fishes that you caught just now.” (v. 11) Simon Peter went aboard and hauled the net onto the land full of large fishes, one hundred and fifty-three in number. And though there were so many, the net was not torn. (v. 13) And Jesus came and took the bread, and gave it to them, and likewise the fish. (v. 14) This is now the third time that Jesus appeared to the disciples after he had risen from the dead. The square root of one hundred and fifty-three, 12.369, is the number of lunar cycles in a solar year, and therefore symbolizes the relationship between the sun and moon as witnessed from the earth. This relationship, as important in antiquity as it is today, determines the day/night cycle, the seasons, the weather, and the tides. One hundred and fifty-three is also a Pythagorean number -- it is the result of creating a right triangle from the harmonic point (3:2) between twelve, symbol of the sun, and thirteen, symbol of the moon. 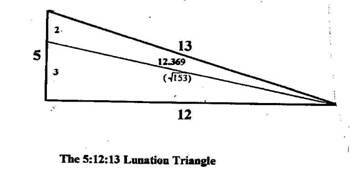 The story of the catch of one hundred and fifty-three fish describes the creation of the lunation triangle within a Pythagorean 5:12:13 triangle. Twelve is the number of divisions of the heavens, the number of Jesus’ disciples, and in ancient cultures, the solar number. Thirteen is the number of disciples plus one, Jesus. It was also the lunar number in ancient times since the moon moves thirteen degrees a day and orbits the earth about thirteen times a year. Five is the number of visible planets. Five, which is three plus two, and can be broken into the ratio of the perfect harmonic, the fifth: 3:2. The exact length of the year and the exact length of the moon’s cycle (365.2422 days and 29.5306 days, respectively) make finding the relationship between the sun and moon a very difficult problem. However, this problem appears to have been solved in ancient times as its solution, one hundred and fifty-three, is built into the structure of both Stonehenge and the Great Pyramid. The number describing the relationship of the sun, moon, and earth may have been known also by the author of the Gospel of St. John since he describes Jesus instructing the disciples how to find it. In this symbolic paradigm, Jesus is the harmonic mean between heaven and earth, indicating where to look for the solution. From within a symbolic 5:12:13 right triangle, if another right triangle is formed at the harmonic mean, by casting the net from the “right side” of the boat, the result is a hypotenuse measuring the square root of one hundred and fifty-three, the exact number of lunations in a year. In making this number explicit, Jesus demonstrates knowledge of hidden things, further proof of his identity as logos. After the disciples caught one hundred and fifty-three fish, “None of the disciples dared ask him, ‘Who are thou?’ knowing that is was the Lord.” (John, Chapter 21, v.12). The numbers in the Gospel of St. John, now interpreted as fact, were intended as symbols. The gospels were written for a pre-Christian audience within a culture saturated with astrological belief. In this setting, numbers descriptive of the heavens used in describing events on earth established a macrocosmic/microcosmic analogy of correspondence between heaven and earth. The Gospel of John ends with “one hundred and fifty-three,” a number with multiple neoplatonic symbolic meanings but also a number accurately describing the ratio, or logos, between sun, moon, and earth. I am not certain that the author of the Gospel of St. John knew the scientific implications of one hundred and fifty-three. He could have chosen this number for its substantial neoplatonic symbolic meaning. What is certain is that in using one hundred and fifty-three in his proof of the identity of Jesus as logos, the author of St. John’s Gospel made an excellent choice. What fascinates me about this number is that it has powerful meaning in two systems of reasoning that would not be expected to have common ground, neoplatonic number symbolism and scientific measurement. Many things have changed since the time of Jesus -- the earth is in many ways smaller, footprints of men mark the moon, and the process by which the sun creates energy has been replicated on earth – but the numbers two, five, twelve, and one hundred and fifty-three are the same, continuously symbolizing the miraculous interrelatedness of all things. And the net is not torn. 1. Winston, David, translator, Philo of Alexandria, Paulist Press, New York, 1981, p. 143. 2. Quirolo, Lynn, “The Enneagram in the Gospel of St. John,” Stopinder, No. 6, Fall 2001, p. 73. 3. Augustine of Hippo, Letter LV to Januarius, Chapter XVII 31. 4. Bamberger, John Eudes, The Praktikos and Chapters on Prayer, Cistercian Publications, Spencer, Massachusetts, 1970, p. 54, footnote 11. 5. Heath, Robin, A Key to Stonehenge, Bluestone Press, High Trenhouse, England, 1993. A simplified version of Mr. Heath’s archeoastronomical research into the purpose and meaning of megalithic structures can be found in his book, Sun, Moon, and Earth, Walker and Company, New York, 1999. 7. St. John, Chapter 6, v. 12-13. 8. This meaning of one hundred and fifty-three was discovered by Robin Heath during his research on megalithic structures. See A Key to Stonehenge.